One Tour de Sox sock is finished. The second sock has 3 links of chain. Yes, I ran 2 of the patterns up into the ribbing area. The brown sweater has one sleeve installed and part of the beading done. 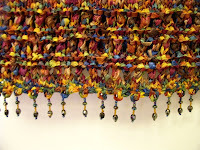 I took a couple of pictures of the neck beads, but they were blurry. I do have a picture of the bottom fringe. 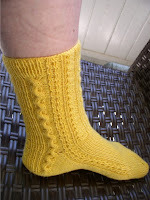 I'll be working on the lavender mystery sock, so that I'll be ready for the next clue, due out tomorrow. 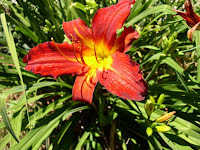 We have some of the less common day lilies in flower now. It has rained so much, that the weeds have taken over. 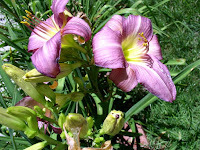 I worked on some of them today, clearing a space for my Mother's Day rose bush. Luckily, it was delivered in a nice pot. It took a while to decide where I wanted to put it. I'll see how clear I got the area in a couple of days. It may need more work before putting the rose in. The bush seems to be happy with all the rain. It has a couple of new blooms on it. Nothing else exciting. Thursdays are my day off, so I ran errands most of the day, ending with the baseball game I wrote about. Today was sort of lazy. It rained again this morning, which made weed pulling easier. Housework, bike race watching (it was on TV), spending time with dog and DH made for a relaxing day.